Kent Eriksen, leading designer and manufacturer of custom bicycle frames, today announced the formation of a new company, Kent Eriksen Cycles. The company will produce a signature line of bicycles designed and manufactured to the individual needs of customers. From his pioneering work in frame building, Eriksen was inducted into the Mountain Bike Hall of Fame in 1996. With over 30 years of experience building custom bikes, Eriksen looks forward to showcasing his latest designs and creations tailored to client wishes. 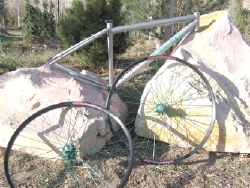 All of Kent Eriksen's bicycles including road, cross, triathlon, mountain and the 29"-wheeled mountain are manufactured using the highest quality titanium from the United States. "Getting back to the customer," is how Kent Eriksen describes his motivation to leave Moots Cycles and start his new venture. "Our customers are looking for individual attention. We work one-on-one to build their ideal bikes. It's really just like when I started out in the late 70s." Eriksen, the iconic Steamboat Springs frame builder is starting over where it all began, back in the historic Sore Saddle building downtown Steamboat Springs. "Our first order was from a guy in Switzerland whose bike design was rejected by other builders. He had some tricky geometry and special requests to accommodate components that were new to me. We got that bike built and shipped it to its new home in Switzerland." The customer writes, "Hello Kent, the frame arrived! Its perfect, a real masterpiece, thank you and best regards, Fabian." Andy Klumb of Toledo, Ohio comments, "I held off on buying a titanium bike until Kent got his business up and running. He is the Master, and I knew he could make a bike better than I could imagine." Kent Eriksen Cycles sells direct and through select dealers. "We encourage people to stop in when visiting the area to see first hand our craftsmanship and shop." For those not able to visit, special attention is paid using the internet to communicate, send pictures and give the feel of being there. Based in Steamboat Springs, Colorado, the company was launched in 2006 by Moots founder, Kent Eriksen and his wife and professional cyclist, Katie Lindquist. In addition the company employs ace titanium welder Chris Moore to finish the frames. For more information contact them at 970.879.8484 or log on to the internet at www.kenteriksen.com.